Become a better driver with instruction from Community Driving School (CDS), a DMV certified driver education school and driver improvement clinic for teenagers and adults. CDS offers the American Automobile Association's Driver Improvement Program. This fast paced course teaches you how to navigate the road safely and covers a wide range of current highway safety driving topics. Drivers who are DMV directed or Court ordered can take this 8 hour class to meet those requirements. Drivers who are interested in earning up to 5 Safe Driving Points can also take this class on a voluntary basis. Click here for more information. Community Driving School (CDS) offers driver's education program for teens to get a driver's license. CDS works alongside all education outlets, private, public, and home schools, to provide driver's education instruction not available otherwise. CDS provides the Virginia State Driver's Ed curriculum that consists of 30 hours of Classroom course work and 14 periods of road training (7 50 minute periods of actual driving and 7 50 minute periods of observation). Driver's Ed at our driving schools located in Powhatan, Midlothian, and Goochland. The Classroom and the Behind-The-Wheel Driver Education segments are offered together and separately. Upon successful completion of the driving lessons and road test, the CDS instructor will issue a 180-Day Virginia Temporary Driver's License to a new driver who meets the driving and age requirements outlined in the Virginia State Code, or a DMV Adult Road Test/Holding Period Waiver document indicating full completion of the Driver Education program and licensing eligibility. To qualify for the Classroom segment, the student should be at least 15 years old. A Learner's Permit is not a requirement for the Classroom segment. Students who are enrolled in the Classroom segment will receive training to prepare them for DMV's Signs and Knowledge tests taken to get the Learner's Permit. Click here for more information. 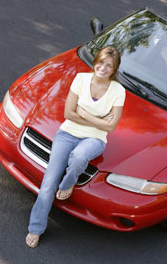 A Learner's Permit is necessary to begin the Behind-the-Wheel segment, and the Classroom segment should also be completed. Students who are 15 years and 6 months old can apply for a Learners Permit at DMV. We encourage teens to get their Learners Permit as soon as they can, even if they intend to take a while to meet the driver training requirements. We also ask that the student drive with family and friends for at least 30 hours before taking Behind the Wheel. Click here for more information. CDS offers adult driver education classes for ages 18 and up. We offer Private Driving Lessons and tailor the instruction to include all of the driving skills that a driver must be able to demonstrate on the DMV road test. Click here for more information. For adults ages 18 and up CDS also offers the full driver education Classroom course and Behind the Wheel. When driver education is completed, the adult will be issued a document which, when presented to DMV, will waive both the 60 day permit holding period and the DMV administered Road Skills test. CDS is a DMV registered Re-exam school. We are licensed to provide the required curriculum to reinstate your eligibility to take the test and help get you that passing grade. The 8 hour Driver Manual class reestablishes eligibility to take the DMV Knowledge test after failing it 3 times previously. On July 1, 2016, the 8-hour Driver Manual Course was opened to teens under 19 provided that they have already taken the 30 hour Driver Education Classroom course. Click here for more information. Community Driving School (CDS) is a VADETS test center. Test candidates must be VADETS registered and have a valid login ID and password. Please contact us for an appointment.